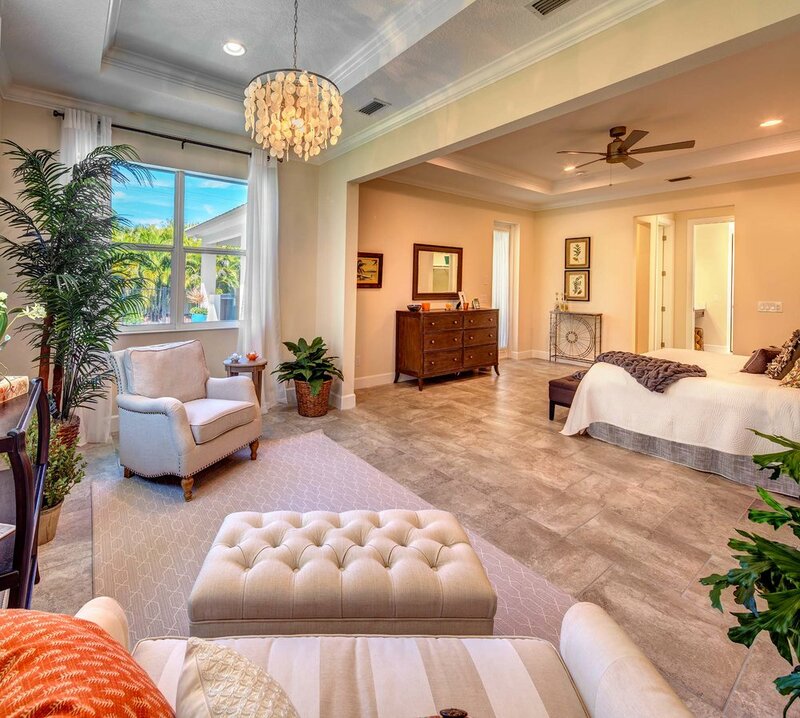 The Cypress model at Sandhill Lake sweeps all awards for it’s category in the 2019 Sarasota Parade of Homes. Conceived and delivered by Heritage Builders, Sarasota’s finest luxury custom home builder, this stunning furnished model home will leave you breathless. The Cypress model features an expansive great room design overlooking the outdoor living area, custom designed pool and 3 acre lake. This residence is an elegantly appointed 2,864 square foot, three bedroom, three bathroom plus a Study and Sun Room. Only be best in quality craftsmanship and materials are used in every Heritage Builders home. Included are 18’’ by 18’’ floor tiles throughout the main living areas and baths, locally made custom cabinets with 3/4’’ plywood boxes (no particle board), granite counter tops in the kitchen, utility room and all baths, 8 foot tall doors throughout, and stainless steel appliances. All of which are included features in every Heritage Builders home at Sandhill Lake. Ideally situated just 2 miles East of I-75 on Clark Road, Sandhill Lake is Sarasota's most celebrated private, gated enclave of 43 single family residences and resort-style Residents' Club. Featuring a heated pool and spa, grilling area, fire pit, Kitchenette and a large Gathering Room for events, playing cards, watching sports or just mingling with neighbors. Please call us today at 941-234-0432 to arrange a private visit, register on our webpage or drop by at your convenience. We look forward to seeing you at Sandhill Lake soon! Available for purchase with leaseback! Heritage Builders, Sarasota’s preeminent builder of luxury custom homes is pleased to announce the sale of a Magnolia on lakefront home site 27 in Sandhill Lake. This elegantly designed residence boasts breathtaking views of the sparkling custom pool and large central lake through the twelve foot wide pocketing sliding glass doors at the Great Room. The Magnolia consists of 3 bedrooms, 3 bathrooms, study, split 3 car garage and a menu of customizable structural and interior options. Sandhill Lake is Sarasota’s newest private, gated enclave of just 43 low maintenance single family homes and Residents’ Club with a heated pool and spa. Our Gifts to You This Holiday Season! Convenient to all Sarasota has to offer, Sandhill Lake is an intimate new enclave of just 43 coastal inspired single-family homes. Behind the private gates, Owners will enjoy the convenience of maintenance-free landscaping and lawn care, Residents’ Club with heated pool and spa, and sparkling central lake. Tour our elegant furnished models to experience the flawless craftsmanship of renowned local luxury custom homebuilder, Heritage Builders. *$15,000 towards new construction applies to interior and structural options. Not applicable to base price of home or closing costs. Offer redeemable on or before January 31, 2019. ** $7,500 towards quick move-in and model homes to be applied at closing as a credit towards closing costs. Not applicable to the home purchase price. Offer redeemable on or before January 31, 2019. The Magnolia II at Sandhill Lake, Sarasota’s newest private, gated enclave of just 43 single family homes, is now move-in ready. Designed and constructed by Heritage Builders, Sarasota’s premier luxury custom home builder, this beautifully appointed 2 story Great Room floor plan consists of 4 bedrooms, 4 bathrooms, study with walk-in closet and split 3 car motor-court garage. Large 18x18 floor tiles, custom all wood cabinetry, granite counter tops, stainless steel appliances, premium Moen plumbing fixtures, hurricane impact windows on the front and second floor, large trim mouldings throughout and 8 foot tall interior doors are just a few of the included features that make this home an exceptional value. The Laurel at Sandhill Lake, Sarasota’s newest, gated enclave of just 43 single family homes, is now move-in ready. Conceived and delivered by Heritage Builders, Sarasota’s premier luxury custom home builder, this beautifully appointed Great Room floor plan consists of 3 bedrooms, 3 bathrooms, study and 2 car motor-court garage. Large 18x18 floor tiles, custom all wood cabinetry, granite counter tops, stainless steel appliances, premium Moen plumbing fixtures, hurricane impact rated windows and doors, large trim mouldings throughout and 8 foot tall interior doors are just a few of the included features that make this home an exceptional value. Sandhill Lake and its exclusive custom home builder, Heritage Builders, were featured in the Sarasota Herald-Tribune’s Business Weekly on October 29, 2018. 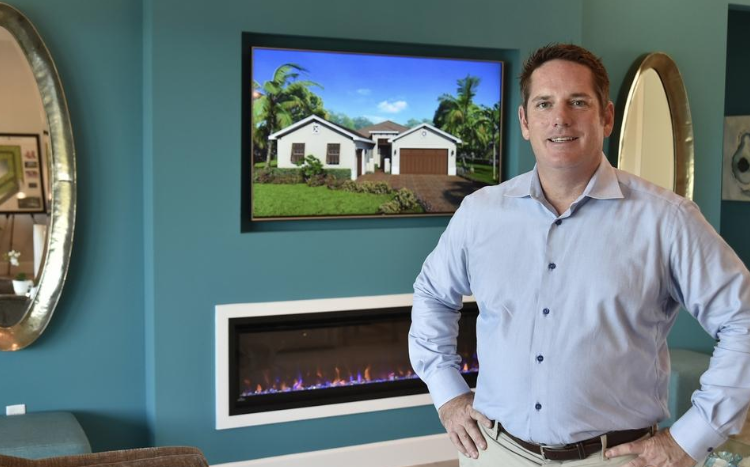 The article profiles the Heritage Builder’s track record of success in Sarasota’s custom home and new home community markets. Steve Brown, one of the company’s principals, is interviewed by the Herald and explains what distinguishes Heritage Builders as a custom home builder and community developer. To read the full article, please visit https://www.heraldtribune.com/news/20181029/small-communities-of-customized-homes-are-heritage-builders-hallmark. PLEASE JOIN US FOR OUR GRAND OPENING WEEKEND OCTOBER 20 AND 21!!! Please join us this weekend, October 20 and 21 for Sandhill Lake’s Grand Opening Celebration. Tour our two designer furnished model homes and quick move-in homes. This stunning gated community has only 43 single-family homes; Residents’ Club with clubhouse, heated pool/spa, outdoor grilling area; fire pit and more. All homes in the community have landscaping and lawn care included for the finest in low-maintenance living. Sandhill Lake is brought to you by Heritage Builders, Sarasota’ finest custom home builder. Please call us at 941-234-0432 or stop by our models from 10am - 4pm, Monday-Sunday. Ideally located on Clark Road, approximately two miles east of I-75. Sandhill Lake is on the right going east. We hope to see you this weekend at Sandhill Lake! We’re putting the final touches on the community, but our model homes are open for preview prior to our Grand Opening Saturday and Sunday, October 20th and 21st. Please stop by Sandhill Hill Lake, as we’re open seven days a week from 10:00am til 4:00pm. One of our knowledgeable Associates will be happy to give you a tour of our designer furnished model homes and tell you what sets Sandhill Lake apart. Please call us today at 941-234-0432 to arrange a private visit, register on our webpage or drop by at your convenience. We look forward to seeing you at Sandhill Lake soon! The Magnolia II - Now Available! Heritage Builders, Sarasota's finest custom home builder proudly presents The Magnolia II. This is a new and innovative floor plan with soaring ceilings, an open concept great room, dining area and gourmet kitchen with oversized island. The kitchen is equipped with stainless steel appliances, custom wood cabinetry, granite counter tops and a walk-in pantry. Architectural details are emphasized throughout the interior and exterior living spaces of this thoughtfully designed home. Featuring exceptional finishes, such as, tray ceilings at the Foyer, Master Suite and Great Room, large format tile throughout main living areas and bathrooms, plush carpeting in all bedrooms, tall base boards and crown molding and 8' tall interior doors. This 5 bedroom, 4 bathroom, with Bonus Room and 3 car garage home represents Florida living at its finest. The 4th bedroom is a flex space which could be utilized as a Study, home gym or hobby room. Sandhill Lake is an exquisite enclave of just 43 customizable single-family homes in a private, gated location convenient to Sarasota’s finest beaches, dining and shopping. Easy, carefree living is enriched by the Residents' Club with resort-style pool, spa and fire pit in this low-maintenance community with landscaping and lawn care included. The Laurel | Now Available! Heritage Builders, Sarasota's most prominent luxury home builder, unveils their newest inventory home, The Laurel, at Sandhill Lake. The Laurel Great Room design offers sweeping views of the Outdoor Living space with plenty of area for a future pool and spa. The breathtaking features include, elegant 20x20 floor tiles throughout the main living areas, 8 foot tall interior doors, all wood interior trim moldings and tall ceilings with trays and crown molding at the Foyer, Great Room and Master Bedroom. The kitchen is equipped with stainless steel appliances, custom wood cabinetry, granite counter tops. Located just 2 miles from I-75 on Clark Road, Sandhill Lake is Sarasota's latest private, gated enclave of 43 single family residences and resort-style Residents' Club. Featuring a heated pool and spa, grilling area, fire pit, Kitchenette and a large Gathering Room for events, playing cards, watching sports or just mingling with neighbors, The Residents' Club is a place for all to enjoy. The Laurel will be move-in ready by late September 2018. For a private showing, please call 941-234-0432. Sandhill Lake, Sarasota's newest gated, private community will open in late August 2018. Designed and developed by Heritage Builders, Sarasota's leading builder of luxury homes, Sandhill Lake is an enclave of just 43 single family residences with a resort style Residents' Club. Exceptional livability and enduring value were at the forefront of designing the four unique coastal and West Indies inspired floor plans that will be offered in Sandhill Lake. Floor plan sizes are 2,500 to 3,500 square feet with 3 to 5 bedrooms, 3 to 4 bathrooms and 2 to 3 car garages. Additionally, the numerous structural and interior options allow every customer to personalize their home to meet their desires. Home and home site packages starting in the low $500,000's. Available inventory homes, The Laurel and The Magnolia II, will be move-in ready by the end of September 2018. The anticipated completion of The Magnolia Model and The Cypress Model is late August 2018, however, the model and inventory homes are available for preview by appointment. To schedule a private tour, please call (941) 234-0432 or email Info@SandhillLake.com. Heritage Builders, Sarasota's most prominent luxury home builder, is please to announce that The Cypress Model in Sandhill Lake is nearing completion. 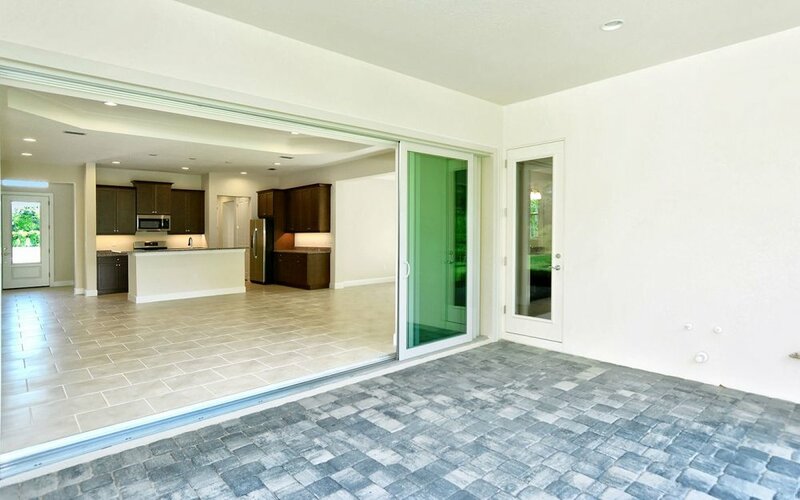 Available with a generous leaseback, this striking coastal inspired model home is situated on one of the many lakefront home sites in Sandhill Lake, Sarasota's newest private, gated community of just 43 single family residences. The Cypress Model boasts panoramic views of the outdoor living space, pool and sprawling 3 acre lake through the 12 foot wide pocketing sliding glass door in the Great Room. The breathtaking features include, elegant 20x20 floor tiles throughout the main living areas, 8 foot tall interior doors, all wood interior trim moldings, tall ceilings with trays and crown molding at the Foyer, Great Room and Master Bedroom, a private outdoor shower in the Master Bathroom. The kitchen is equipped with stainless steel appliances, custom wood cabinetry, granite counter tops and a walk-in pantry. Architectural details are emphasized throughout the interior and exterior living spaces of this designer model home. Completion is anticipated for late Summer of 2018. The Magnolia Model on home site 29 in Sandhill Lake is a West Indies inspired home thoughtfully conceived and delivered by, Heritage Builders, Sarasota's premier luxury custom home builder. With soaring ceilings, the open concept great room overlooks the expansive outdoor living area, custom designed pool, spa, outdoor kitchen and sprawling lake. The kitchen is equipped with stainless steel appliances, custom wood cabinetry, granite counter tops and a walk-in pantry. Architectural details are emphasized throughout the interior and exterior living spaces of this designer model home. Completion is anticipated for late Summer of 2018. Heritage Builder is pleased to announce The Magnolia swept all awards in its category and took the coveted "Best Overall" nod in the 2018 Parade of Homes. This Coastal Florida-inspired home features clean architectural lines, breathtaking designer finishes and true custom touches, all brought to you by Sarasota's boutique custom home builder, Heritage Builders. The Magnolia is available for sale at Sandhill Lake, Heritage Builders' latest new home community, centrally located in Sarasota. Please stop by during business hours. Or, for a private showing, please call 941-234-0432. Please visit the Magnolia designer furnished model at the 2018 Parade of Homes. This is the inaugural showing for the Magnolia and the Heritage Builders team is excited to unveil this residence to the public. The Parade of Homes runs Saturday February 17 through Sunday March 11. For more information about Sandhill Lake or to schedule a private showing of the Magnolia, please call us at 941-234-0432. The Magnolia model at the Sandhill Lake Preview Center features a stunning Owners' Suite with an optional Sun Room. This breathtaking feature not only adds impressive depth to an already spacious Master Bedroom, it also brings in an abundance of natural light and functional space for reading, lounging or a desk. Please visit the Sandhill Lake Preview Center at Ashton Oaks. Heritage Builders is please to announce the opening of the Sandhill Lake Preview Center. The Sandhill Lake Community is now under construction, with a project completion date of Spring 2018. In the meantime, interested purchases can visit the Sandhill Lake Preview Center, conveniently located at Heritage Builders' Ashton Oaks community, located in central Sarasota and only minutes from the Sandhill Lake site. The Sandhill Lake Preview Center is housed in the Magnolia model, which can be built at Sandhill Lake on your choice of home site. Please register below and we will send you information about Sarasota's finest new home community. Thank you for your interest. Thank you for your interest in Sandhill Lake. An Associate will contact you shortly with more information.